No Wax Build Up On Your Floors! This stone and marble floor polish will protect the finish of your natural stone floor while providing a non slip surface! Keep the finish of your natural stone floor shiny and new looking! 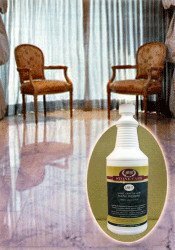 With a unique blend of fine synthetic resins, this stone and marble floor polish protects your polished stone floor with an invisible, non slippery buffer. This helps delay the visual effects of wear and tear patterns on your floor, especially where there's high traffic... entryways, foyers, etc. Because this product is NOT a wax, there's no build up and it NEVER needs to be stripped. 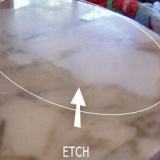 It works very effectively on granite and marble floor tile as well as high gloss wood floors! Maintain your floor by mopping regularly with a floor cleaner made for stone. Protect your floor by applying a stone polish for floors. 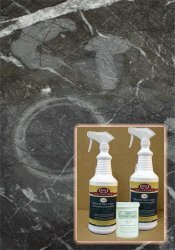 PRODUCT DISCONTINUED - Look at this stone floor polish. Be sure that the floor is absolutely clean. Any coats of old wax must be thoroughly removed. 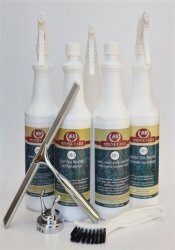 Pour 1 cap full of stone polish directly onto your stone or hardwood surface. 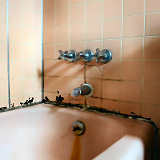 Immediately spread it over an area of about 30 square feet using a mop dampened with clear water only. Buff to a shine using triple odd steel wool pads. For easier operation, use a residential floor polishing machine. The floor polish is the very best product line available to the end user of Stone for protecting the glossy finish of your stone floor. Easy to maintain - no professional stripper required here! Thank you! I just finished applying the products to the granite in the kitchen. All of the products worked as promised and the end result looks fantastic! Thank you so much for the effort you took in getting the shipment to us in Virginia. We did receive it, tried your product and love it. In the future we will order again from your company.